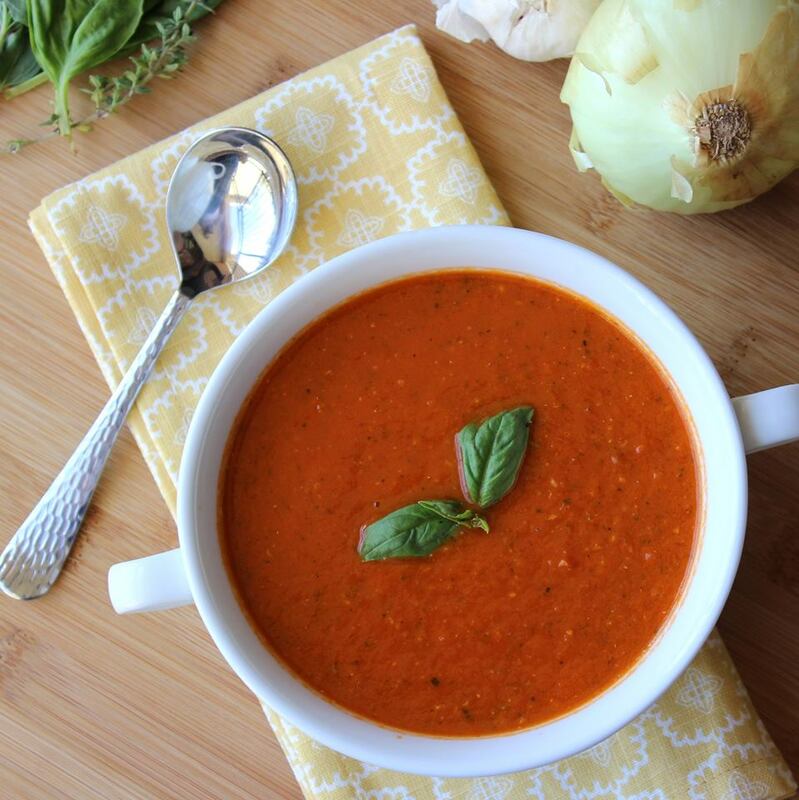 We are now firmly into the British winter, so for today’s blog, I thought I would post about a great healthy homemade Tomato, carrot & basil soup recipe (with no added sugar) that I have loved as a winter warmer for a few years now! Because lets face it, there’s nothing quite like a nice hot bowl of tomato soup on a cold day, it just cuddles you from the inside! …And once you realise how easy it is to make and how much better it tastes than tinned soup (not to mention how much healthier it is), we think you won’t bother going back to cans again! It’s packed full of natural flavors, vitamins and goodness and should leave you feeling full of energy, ready to tackle the rest of the day. Place the tomatoes and carrot onto a baking tray, drizzle with oil, season with salt and pepper then roast for 30 minutes in the oven at around 200 degrees. Meanwhile, sweat (without colouring) the onion and garlic in a pan with the lid on for 5 minutes. When cooked, add the roasted tomatoes and carrots from the oven along with the vegetable stock. Simmer for 10 minutes before transferring to a blender. Blitz along with the basil until smooth, then add in the yoghurt and balsamic vinegar – pulse again until incorporated. Season and serve in bowls with some more fresh basil on top. And there you have it, give this healthy soup recipe a go and let us know your thoughts. It should make a few bowls, so either share the love or keep the batch in the fridge ready for another day. If you would like to learn more about Nutrition and how it can benefit the body during exercise – check out our Full Diploma in Personal Training which qualifies you as a Level 3 Nutritional Advisor.